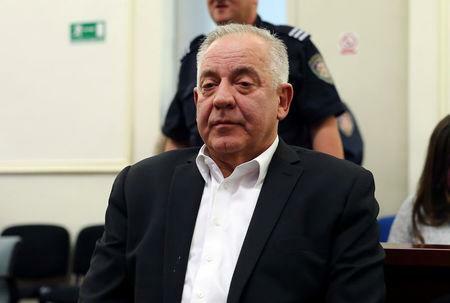 ZAGREB (Reuters) - Former Croatian prime minister, Ivo Sanader, was sentenced to two-and-a-half years in prison on Monday for taking a bribe from Austria's then Hypo Alpe Adria bank during the 1991-95 war. Sanader - who has dismissed the proceedings as politically motivated - was not taken into custody and left the court without making a statement. His lawyer, Jadranka Slokovic, said he had already spent longer than that period in detention and would appeal. The judge said Sanader received 3.6 million kuna ($556,156.34) from Hypo when he was deputy foreign minister - an act that she said amounted to war profiteering. He then cleared the way for the bank - which has since collapsed - to loan Croatia money to buy buildings for embassies and consulates, the judge added in a statement broadcast live on TV. Sanader, who went on to become prime minister from 2003 to 2009, was originally convicted and jailed over the case in 2012 - then had the conviction overturned three years ago after the Constitutional Court said he had been denied a fair trial. At the end of his re-trial on Monday, the court ordered Sanader to pay back the bribe to the state. In a separate re-trial set to begin on Tuesday, Sanader is charged with taking a bribe from Hungarian energy group MOL in 2008 to let it get a dominant position in Croatia's energy firm INA. MOL's chief executive Zsolt Hernadi is also charged and will be tried in absentia. Sanader, Hernadi and MOL have all denied any wrongdoing in that case.